When Android was launched in 2007 there was great anticipation about what the first handset would look like, and in September 2008 we saw the launch of the world’s first Android smartphone – the T-Mobile G1. Although the G1 was OK, you needed to be a T-Mobile customer to get it in most regions and it lacked the polish and elegance of the iPhone 3G. 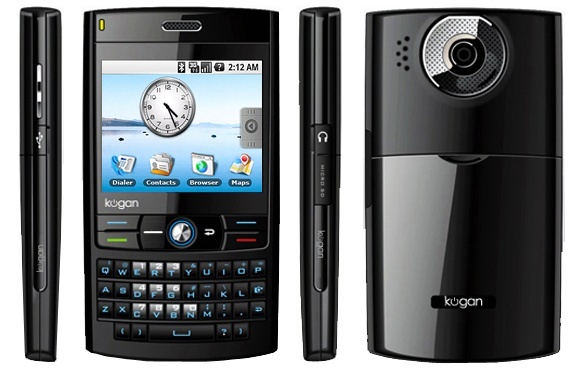 There was a lot of excitement over what Android phone would come next, but it nobody expected it to come from Kogan. If you don’t live in Australia there is a good chance you haven’t heard of Kogan. Founded in 2006 but twenty-something entrepreneur Ruslan Kogan, the company at first was involved in selling electronics such as TV sets. Over the years Kogan’s retail offerings have expanded and started to include financial products, travel services and it became an internet service provider. All of this expansion was no doubt made a little easier by the absence of Amazon until November 2017, allowing Kogan to grow massively. But back in 2008 while a relatively small company, it decided to branch out into the smartphone market. Unlike most electronics retailers, Kogan worked closely with the east Asian manufacturers of their products to come up with new products. To this end they announced the closely related Kogan Agora and Agora Pro Android smartphones in December 2008. Kogan Agora Pro. A camera! WiFi! GPS! The standard Agora had a 2.5” 320 x 240 pixel touchscreen display, 3.5G support and… errr… well, not much more it turns out because the Agora was strictly a misery-spec smartphone, but then it did only cost AU$299 or about £175. If you wanted essentials such as WiFi, GPS and a camera you’d need to fork out AU$399. The BlackBerryesque design of the Agora didn’t seem that odd back in 2008, both because of the prevalence of BlackBerry handsets themselves, and the fact that there had only been one Android handset to date – the G1 – and that too had a physical keyboard. In truth though the need for a physical keyboard was a limitation of early versions of Android, as Google’s prototype (and touchscreen-less) Sooner handset demonstrated. It might seem obvious to us today that the Agora wasn’t going to have the appeal that the big-screen G1 did, and indeed Kogan got cold feet shortly before the launch and effectively cancelled the product. There was an outcry at the time and accusations that it had all been a publicity stunt, but the Agora does seem to be under-powered in retrospect. Other manufacturers tried a similar format, the Samsung Galaxy Pro and HTC ChaCha being examples. None of these have been particular popular, although BlackBerry persists with physical keyboards today. The Agora never made it to be the second Android phone to market, instead it was a keyboardless version of the G1 known as the HTC Magic. A few months later though, Samsung debuted the I7500 Galaxy which brought forth an enormous family of hundreds of other Galaxy handsets. The flop with the Agora didn’t do Kogan much harm in the end either, and they use the Agora name today for their current crop of smartphones.